We teach you how to find, read, analyze, and apply Google Analytics data for your website. Learn how to use Google Analytics data to make smarter marketing decisions and investments for your online business. Most business owners know that Google Analytics is important. You hear it everywhere, your web developer has mentioned it, you’ve heard marketers talk about it — but it’s more than just a buzzword. 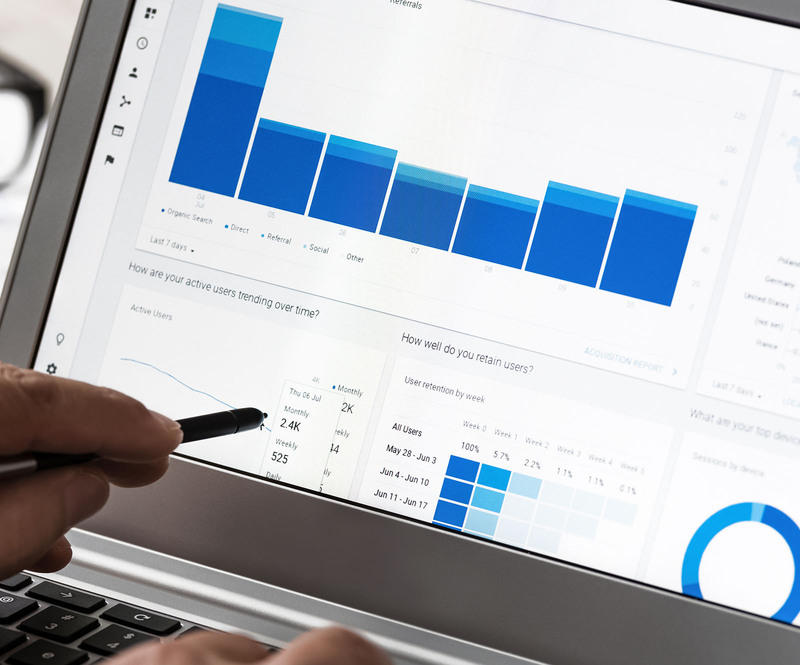 Google Analytics offers up some incredibly insightful data that can answer many questions about your customers, your marketing, and your overall business. You’re able to see how many users have visited your site within a given timeframe (in this case, it’s the past 7 days, but you can modify the dates), how much revenue your online store generated, how many sessions (or number of times your users visited your website) and what the conversion rate was (the percentage of sessions that resulted in an ecommerce transaction). You’ll even be able to see how many people are active on your site! As you scroll down, you’ll be able to see exactly how your website visitors entered your website. Organic Search means that people found you by typing in a phrase or keywords into the search engine and your page displayed in the search results. Direct traffic is derived from those who typed in your URL directly into their web browser. Social is traffic generated from social media channels like YouTube, Facebook, Instagram, and so on. Referral traffic stems from links on other people’s websites. For example, if a user were to click on the above Inflatable Boats 4 Less link to visit their site, that visit would be counted as Referral traffic, since you learned about them from a third-party website. In the example below, you’ll see that Organic Search was the top source of traffic for this company. You can also choose to dive a bit deeper into exactly where the users are coming from. By clicking on Source/Medium, you’ll be able to see the URLs or which social media channels are directing traffic to your site. To get a bigger picture, you’ll need to navigate to a different page of Analytics. I also sorted this data by revenues to see which pages generated the most sales. You can also sort the data by the other metrics by simply clicking the gray title box. In this example, Yahoo organic, Bing organic, and Google organic are our top 3 sources of revenue. The next thing we’ll do is take a look at what devices users are using to visit the website. On the left hand column, click “Audience” > Mobile > Overview and set the appropriate time frame. In this example, a majority of web traffic is generated from mobile, however, both desktop and mobile have roughly the same conversion rate. Though people are browsing on their tablets, they’re not converting quite yet. You can see that there are two spectrums here: either the user will purchase immediately, or it takes a little bit longer. (In this case, it makes sense because the product is of higher investment.) Also, keep in mind that this is a 30-day window. When you look at this data, you’ll want to make sure you’ve collected at least 3-6 months of data to make any assumptions. Now that you understand what data you need to monitor and how to locate it, how do you analyze it to make smarter marketing decisions? What kind of information can you extract from it? Understanding where your website traffic is coming from will help you identify opportunities to improve efforts for specific channels. In the examples above, Organic Search is a huge traffic driver for Inflatable Boats 4 Less. This indicates their organic search ranking is very good, they’re visible, and reaching the right people to convert. The lowest traffic drivers are between Referral and Social. This indicates an opportunity to collaborate with other brands to refer traffic to/from, and bolster social media marketing efforts. (You’ll also see this number decrease when a huge social media campaign comes to an end.) If you see Direct is a traffic driver, that’s great news! This indicates that your brand awareness initiatives are working, and people remember your company enough to type it in directly into their browser. The lower your bounce rate, the better. There’s a lot you can extract from this small piece of data. If people are staying longer on your site and visiting multiple pages, your marketing is attracting the right audiences. Your marketing messaging and website landing pages are cohesive. If your bounce rates are super high, and people aren’t staying on your website, it could be two things: either you’re not resonating with the right audience, or your website isn’t user-friendly. According to reports, if you can’t capture a user’s attention within 7 seconds, they’re going to leave. If you’re solely an online retailer, this data is especially important. Understanding when to expect sales will help ease your marketing stress. Most know that marketing isn’t a magic wand that can make people want to buy your product, but it’s nice to know when you can start looking out for sales after you’ve launched your big campaign. In this case, if the customer didn’t purchase immediately from Organic Search, then they took up to 30 days from their first interaction to make a purchase. And up to 7 interactions at that! They’re clearly doing their research and making sure they want to buy from the company before finally pulling the trigger. Now that you know how to find the important data in Google Analytics and how to analyze it, now it’s time to make some action items for you and your team! Whether it’s a website refresh, expanding your SEO efforts, or online marketing — you now have the tools to create a killer campaign that truly drives the results you’re looking for!